A grateful nation gives honor where honor is due. 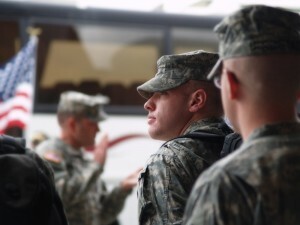 Touro University Worldwide is committed to meeting the unique needs of military students and their families. Military students stand to benefit the most from the advantages of online learning. The format naturally lends itself to the logistical challenges military families may face when pursuing a degree. Together with TUW’s tuition discounts for active duty and retired military members, as well as their spouses and children, students can earn a quality degree on their terms without financial strain. Service members should refer to their ESO when considering TUW as a school of choice. Active duty military, retired, DoD civilians (non-contractor), and spouses and children of active duty and retired may qualify for discounted tuition. Rates are variable depending on the level at which the student studies. Access your classes and assignments on your schedule from anywhere in the world. TUW offers classes in accelerated, eight-week terms, so you can learn at whatever pace best suits your needs. All materials for TUW are fully online; there are no costly textbooks to purchase. All you need is your computer and an Internet connection. Touro University Worldwide wants to make earning a degree as simple as possible for military personnel and their families. If you have additional questions or concerns, please contact an enrollment counselor today.